1. What is a Service Dog? 2. Will I qualify as disabled? Below is a short list of qualifying disabilities. Service Dogs,Emotional Support Dogs and Therapy Dogs can benefit people with disabilities associated with many diagnoses, including: Arthritis Ataxia (poor balance) Autism Blindness or Impaired Vision Deafness or Impaired Hearing Diabetes Cardio/Pulmonary Disease Cerebral Palsy Physical mobility Issues Multiple Sclerosis (M.S.) Psychiatric Disabilities Seizure Disorders (Epilepsy) Severe Allergy Alert Spina Bifida Spinal Cord/Head Trauma Stroke Anxiety Depression Bipolar disorder Mood disorder Fear/phobias Post-Traumatic Stress Disorder Suicidal Thoughts/Tendencies Adjustment Disorder Generalized anxiety disorder Social anxiety disorder Panic disorder Separation anxiety Dissociative Disorders Factitious Disorders Eating Disorders Impulse-Control Disorders Mental Disorders Due to a General Medical Condition Neurocognitive Disorders Mood Disorders Neurodevelopmental Disorders Personality Disorders Psychotic Disorders Sexual and Gender Identity Disorders Sleep Disorders Somatoform Disorders Substance Related Disorders This is just a partial list of disabilities that qualify under ADA. 3. What are my rights with regard to my Service Dog? How am I protected? 4. What is a Psychiatric Service Animal (PSA)? Psychiatric Service Dogs are like any other service animal. They are individually trained in obedience, performing tasks, and working in distracting public environments to mitigate their partner’s psychiatric disability. Their function is not to provide emotional support, but to perform tasks which enable their partner to function in ordinary ways the non-disabled take for granted.It is not enough to have a mental illness to qualify as a person with a disability under the ADA. According to the National Institute of Mental Health (NIMH), 26.2% of adults in the U.S. suffer from a mental illness in any given year, but only 6% are severely mentally ill. So more than three quarters of those with a diagnosed mental illness are not disabled by that illness and would not qualify to use a service animal even if they would benefit from one.A task is a trained behavior that mitigates a person’s disability by doing something the partner cannot do for themselves, but must be able to do in order to live. Even if you could benefit from a trained behavior, if you could do it for yourself, then it would not qualify as a task for your specific disability. A wheelchair might be a help to a person experiencing stiffness from arthritis, but if they are capable of walking on their own, then a wheelchair isn’t really needed. Similarly, a dog trained to remind a handler to take medication, though helpful, would not truly be needed if the person was able to remind themselves to take their medication in ordinary ways, such as using an alarm.Click here to see a list of possible tasks for a PSA. 5. What is the difference between a Service Animal, Psychiatric Service Animal, and Assistance Animal? They are the same, with respect to protections and rights. 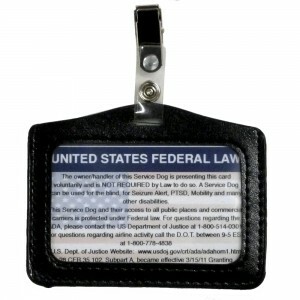 The term “Service Dog” is the federal legal term and the most commonly used. 6. What is an Emotional Support Animal (ESA) and how is it treated differently than a Service Animal? An ESA may fly in the cabin of a commercial or private airline with their disabled handler, and the handler does not have to pay a pet or other fee. A very specific prescription letter from a licensed mental health profession is ALWAYS required by airlines, as well as advance notice in most cases that the passenger will be flying with an ESA. Landlords and property managers must make reasonable accommodations for tenants or prospective tenants with ESAs, even if the apartment, house, college dorm, or other residence does not allow pets. Reasonable fees may be asked of the client, similar to a pet fee. Besides requiring a letter of prescription. Property managers/landlords may require that the (prospective) tenant’s mental health professional complete and sign a Third Party Verification form. Click here to see different types of Licensed Mental Health Professionals. 7. What is a Companion Animal/Dog? The term “Companion dog” usually describes a dog that provides only companionship as a pet, rather than performing useful or necessary tasks. Companion dogs, since they are considered only pets, have no protections under the ADA. 8. What is a Therapy Dog? A therapy dog is a dog trained to provide affection and comfort to people in hospitals, retirement homes, nursing homes, schools, and to people with learning difficulties and stressful situations such as disaster areas. They are NOT considered service or emotional support dogs and have absolutely no protections under the ADA. 9. What species of animal can be a Service Animal? The only animals allowed to serve as service animals are any breed of dog and, in some cases, miniature horses. With respect to Emotional Support Animals, there are no species or breed restictions. Consequently, cats, rabbits, miniature pigs, ferrets, birds, etc. may be ESAs. 10. Is there a size restriction for Emotional Support Animal? No there are no size restrictions on the species of animal that can serve as an ESA. 11. What species of animal can be an Emotional Support Animal? The Federal laws that protect Emotional Support Animals and their handlers (the Fair Housing Amendments Act of 1988, Air Carrier Access Act 49 U.S.C. 41705, and Dept. of Transportation 14 C.F.R. Part 382), neither specify nor exclude any animal species or breed. Common sense should prevail, however. For example, although property managers are required to make a reasonable exception to the rules to accommodate a person with an ESA, the justice system would side with the property manager who rejects a tenant who wishes to have a mule as an ESA living inside the apartment. Similarly, airlines may require any animal that is too large to sit between the knees of the disabled passenger and the seat in front of him/her to be crated and transported elsewhere in the plane. Common ESAs include dogs, cats, birds, mice, rats, hedgehogs, rabbits, snakes, miniature pigs, monkeys, and more. 12. 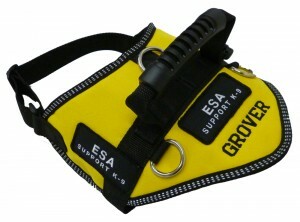 I want a Service Dog or ESA for personal protection. Does that kind of service qualify? The crime deterrent effects of an animal’s presence DO NOT constitute work or tasks to qualify as a Service Dog. The same applies to an Emotional Support Animal (ESA).If a person has experienced a traumatic event or has intense fear, whether justified or not related to a physical attack, they may qualify for an ESA to ameliorate symptoms associated with that “disability”, provided a licensed mental health professional provides a letter of prescription reinforcing it. Although the animal may be trained for personal protection, “Crime Deterrence” or personal protection are not approved justification for qualifying for an ESA. 13. Are there circumstances in which a business can ask me to leave with my Service Dog? Yes, although these are very limited circumstances. For example, if a disabled handler is not adequately controlling or attending to a misbehaving service animal (who is barking, unruly, defecating or urinating in the area, etc., the handler may be legally asked to remove the service dog.Although hospitals, medical or dental offices, and other healthcare provider sites, as places of public accommodation, must permit the use of a service animal by an individual with a disability, they may enforce “no pets” policies in certain areas (such as operating rooms) if they can show that permitting service animals in would result in a fundamental alteration or safety hazard to those areas. For example, if appropriate medical personnel can show that the presence or use of a service animal would pose a significant health risk in certain designated areas of a hospital, then service animals may legally be excluded in those areas (ADA Title III Technical Assistance Manual, 4.2300).Similarly, zoos must modify their policies to permit the use of a service animal by an individual with a disability unless the animal creates a fundamental alteration or safety hazard. Zoos have debated the effects of service dogs in particular being perceived as predators by the resident animals and stressing the animals. Exclusion of a service animal must be based on fact, not assumptions. Because zoo animals are exposed to multiple stressors (behavior of visitors, loud noises, etc.) the exclusion of a service animal from an area would have to be supported by actual evidence – not simple perceptions or assumptions. 14. What can a business ask or require when I’m accompanied by my Service Dog? By law, public entities (businesses and their representatives) are allowed to question a disabled handler to verify that they qualify to enter with a service animal. Although the questions may take a wide variety of forms, they are limited to the following:First, the handler may be asked to verbally confirm that he is disabled and that the dog is his/her service dog. The public entity, may NOT ask about the person’s disability, however. Obviously, this is an easy question to answer. Second, the handler may be asked what major life task the animal is trained to perform for the handler. The handler should be able to provide credible verbal evidence to this question. If the handler hasn’t rehearsed the answer so it flows smoothly or the answer isn’t credible, then they may be denied. For example, if the handler explains that his dog carries his insulin or candy for him because he is diabetic, that isn’t a credible (major life) task. Why? Because the handler has pockets, can wear a fanny pack, or carry a bag to hold the insulin, etc. The answer must support the need for the service animal, based on the criteria of the ADA. 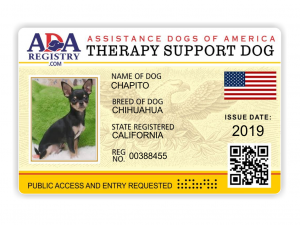 Finally, a public entity MAY NOT ask for registration or certification documents, ID cards, a letter from a physician, and may not require that a service dog wear a harness or vest with service animal insignia (although most wise handlers will make sure their dog is appropriately attired and easily identified as a service animal). NOTE: Although businesses are very limited in what they can ask and require by law, that doesn’t mean that every business or its representative actually KNOWS or obeys the law. They may believe they know what they are allowed to ask and request, yet inadvertently break the law. It is paramount that a disabled handler with a service dog actually knows what the law is and be able to articulate it. 15. What do I do if I believe I’ve been discriminated against? If you are illegally denied access to or otherwise discriminated against in a place of public accommodation because of your service animal, you should remain calm. You should explain that the ADA (or state law if it provides greater protection) protects your right to be accompanied by your service animal in places of public accommodation. If that doesn’t get you admitted, you should ask to speak to the manager or supervisor, and then repeat the explanation to the supervisor. If you are still denied, you can politely offer to call the police to have them explain the law.Note: Some states still have statutes that are more restrictive than the ADA. The police are charged only with the enforcement of state, not federal law. You should know what the law is in the state where you are. If the public accommodation refuses to admit you and the state law excludes you (e.g., if they have an owner-trained dog for mobility and the state law recognizes only “guide and hearing dogs from accredited training programs”), you can file a complaint with the US Department of Justice or hire a lawyer to file a suit in federal court.Sometimes writing a letter to the person who owns the facility will result in an apology and a change in policy. In addition, disability advocacy groups might be interested in pursuing the issue on your behalf. 16. 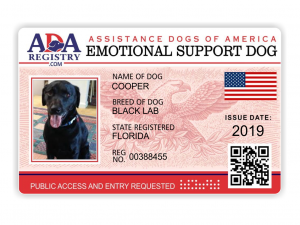 Must a service dog or Emotional Support Animal (ESA) be certified or registered? No. Although service dogs are NOT required by law to be registered, to make life easier for handlers with service dogs and ESAs. Registration eliminates 99% of hassles and confrontations from the public. 17. Will I need a letter that prescribes an Emotional Support Animal? Yes, if you plan to take advantage of the protections provided by the ADA and Fair Housing Act. Airlines have very specific requirements around this, as do most property managers.This letter must be written by an emotionally/psychologically disabled person’s Licensed Mental Health Professional (LMHP) that prescribes an ESA to enable the person to function normally. The letter must be written on the letterhead of the LMHP, contain very specific statements regarding the client, and list the licensing information of the LMHP in order to be acceptable to airline companies and property managers.An emotionally/psychologically disabled person who has or wants to obtain an emotional support animal can register their dog WITHOUT a letter of prescription, but will need to present the letter of prescription to fly with their ESA or to qualify for no pet housing. 18. Does a Service Dog require professional training to be registered? No. Although by definition, a Service Dog/Animal is trained to perform tasks assisting someone who is disabled, that training can be completed by anyone, anywhere. Training does not need to be facilitated by an expert or professional trainer. Many people have trained their own animals or have been assisted by friends and family, and there are numerous resources to help the home trainer. Most important is that the training enables the animal to 1) perform the tasks required to assist its disabled handler and 2) be well controlled in public. 19. What kind of training is required for an Emotional Support Animal (ESA)? 20. Are Service Dogs or Emotional Support Animals required to wear special patches, harnesses, or equipment? The ADA does not require any special equipment, clothing, or patches to identify your animal as a Service Dog. 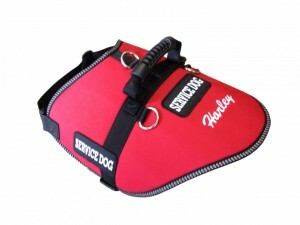 It is STRONGLY encouraged that all clients make their dog look like a legitimate service dog, including an appropriate vest or harness (our webmaster harness is an excellent choice), service animal patches, and the ID card visibly displayed – clipped to the harness or leash. You will thank us for this advice. 21. 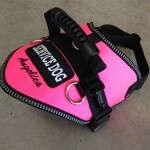 Is there an official color associated with Service Dog harnesses, capes, or vests? There are no standard colors for service dogs or for a service type. 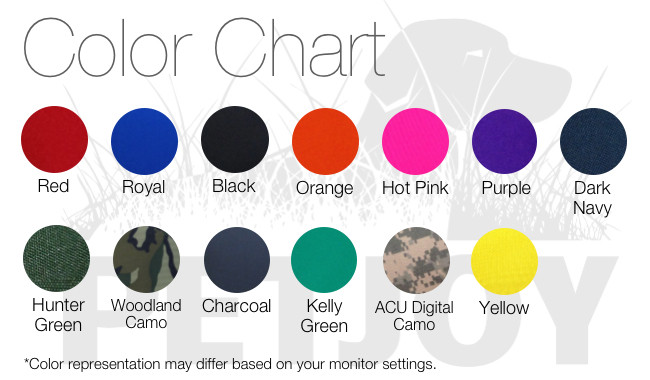 Most people use solid red or green for their service vests or harnesses because these colors “look” official. 22. What do I get when I sign up for registration? With your registration you will receive 1) Electronic ID card, 2) Electronic Certificate of Registration, ) You will have the option of ordering the physical versions as well..
23. What are the benefits of registration? 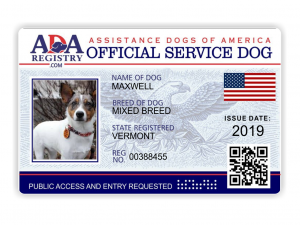 The biggest benefit of registering your dog as a Service Dog is that the documentation, photo IDs, and Service Dog patches we’ll send you make your disability and Service Dog visibly official. That means fewer businesses will question you, and you’ll have documented reinforcement for the ones that do. No more long, drawn out explanations, justifications, or denials. 24. Can a business refuse to honor my registration? First of all, if your dog is Service Animal, businesses MUST allow both of you to enter. This is true even if you have no photo ID card, Service Dog patches, or any other identifying information. Having your Photo ID Card and any other identifying patches, etc., will make entering a business question-free 99% of the time. You are responsible for the training and manners of your dog while in public, however, and if your dog is barking in a theater or restaurant or otherwise being disruptive, the owner of that establishment can legally ask you to either leave or to remove your dog from the business. 25. Do Registration documents or Photo ID cards list my disability or personal information? No medical information or personal contact information is contained on the ID card. 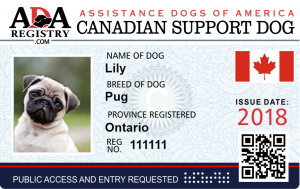 The photo ID identifies your Service Dog/Animal and contains the associated registration number for reference. 26. Do you require evidence of my disability to register a Service Dog/Animal? All applicants must declare that they are disabled, based on the ADA definitions and interpretations. We do not require disclosure of your specific disability for your application to be processed. And we will never voluntarily disclose or provide any of your private information to anyone. 27. When registering, I’m not sure which service “type” I should select. HELP! There are several service types offered ESA (Emotional Support Animal), Guide, Hearing Alert, In Training, Medical Alert, Medical Assistance, Mobility, PSA (Psychiatric Service Animal), Seizure Alert.Medical Assistance covers a broad range of services, so that’s a safe type to select. Otherwise, it’s whatever makes most sense, with respect to the actual service performed by the dog. This is not a legal, nor life changing decision. 28. Is a photo of my dog necessary? No, however if you would like to add the photo we’ll need an image of your dog to process your dog’s photo ID. 29. What kind of photo is needed? We need one clear color photo of your Service Dog/Animal. We prefer digital or scanned images that predominantly show the animal’s head. These images can be uploaded to our site or you can email them to us as an attachment. We prefer large images so we can crop and enhance, as necessary. Large files typically make better ID pictures. 30. How do I send you a photo? 31. What forms of payment do you accept? You can pay using your Visa, MasterCard, American Express, Discover, Debit Card, PayPal, . 32. How long will it take to receive my order with normal processing? We make every attempt to offer a fast turnaround service. Processing times vary due to our workload, but on average, we process your application and usually send your order within 2 – 3 business days after your image is received for your registration. All orders are shipped via USPS Priority Mail, which usually takes 2 -3 days to arrive. 33. Do you have rush service? I’m in a hurry. We process and complete all orders within a couple of days typically, but do offer expedited processing at an additional cost. 34. I live outside the U.S. can I still register my Service Dog/Animal? Absolutely. We have many international clients who travel and fly to many international destinations. Once you place your order, however, we will contact you to let you know if there are additional shipping costs involved, how much they’ll be, and a request for your approval. 35. Will I ever need to renew my registration? Your registration is good for the life of your Service Dog/Animal, so no renewal is ever necessary for your Service Dog/Animal. If you get a new service dog or another Service Dog/Animal, you’ll need to order a new “registration kit” for the new animal. All custom orders are final and can not be returned or exchanged. Registrations that contain digital content are not refundable due to their immediate delivery. If your order arrives damaged please report it within 24 hours. The vest has a lifetime warranty. IMPORTANT: CLOTHING THAT IS RETURNED MUST BE FREE OF ALL DOG HAIR, ODOR AND STAINS. IT MUST ALSO INCLUDE ORIGINAL TAGS WHERE APPLICABLE – THAT MEANS BRAND NEW, AND NEVER WORN. IF YOUR RETURN ARRIVES WITH DOG HAIR, ODORS OR STAINS, MISSING TAGS OR ANY OTHER SIGNS OF WEAR, NO REFUND WILL BE ISSUED. THIS IS STRICTLY ENFORCED DUE TO OBVIOUS HYGENIC ISSUES. IN ORDER TO INSURE A PROPER REFUND, MAKE SURE YOUR ITEM IS IN BRAND NEW CONDITION. We will replace via ground shipping, any product (see Service Dog Vests exception above) which within the following 30 day product warranty period; All products have a full 30 day, 100% satisfaction guarantee (food, treats, consumables, special orders and clearance items do NOT apply. Beds also do NOT apply due to health concerns). As noted above, all SERVICE DOG/WORKING DOG Equipment can only be returned in new, resalable condition for EXCHANGE ONLY. Returned products must be sent back in the exact condition you received them in. Any applicable tags must still be on the product. When returning a product, you are also responsible for the shipping cost to return the item(s) to us. For your protection, you may want to insure the return shipment as we will not be held responsible for the condition of the products being returned or for lost or misdirected items shipped back to us. YOU MUST CONTACT US FOR A RETURN AUTHORIZATION NUMBER, INSTRUCTIONS AND SHIPPING ADDRESS BEFORE RETURNING ANY PRODUCT. Once the returned product(s) have been received and inspected by us for damage or wear, your refund will be processed using the same purchase method used to acquire the item(s). See Service Dog Vests exception above. If second day or overnight shipping charges are applicable to your order, those charges will not be refunded. UNDER NO CIRCUMSTANCES ARE RETURNS ACCEPTED ON SPECIAL ORDER ITEMS, CUSTOM ORDERS OR DIGITAL MEDIA OR CLEARANCE ITEMS!